With over two decades of going from strength to strength, Hollywood Bowl has established itself as the nation’s favourite place to bowl. With an incredible array of activities on offer, Hollywood Bowl gives you so much more than just a great game. Kids will love their big day out, but you can never be too grown-up to enjoy Hollywood Bowl. Away from the alleys, adults can unwind with a cold beer or a delicious cocktail in one of Hollywood Bowl’s plush lounges, and kids can delight in the huge range of attractions and arcade games. Go head-to-head in air hockey, rip up the racetrack in one of their racing games, or simply kick back at the bar with a cold one, you’re really spoilt for choice at Hollywood Bowl. Get the ball rolling with one of our fantastic promo codes, you’ve no time to Spare! How do I use my Hollywood Bowl promo code? Discount is included in the final price! Sign up to Hollywood Bowl’s mailing list to receive exclusive VIP deals and offers! Can I bowl in my own shoes at Hollywood Bowl? So long as your shoes are flat-soled you are more than welcome to bowl in them. If not, we’re happy to provide you with some. Do Hollywood Bowl have a limit on how many can bowl per lane? Hollywood Bowl usually recommends no more than 6 per lane, but most centres have an upper limit of 8. Do games at Hollywood Bowl have a time limit? You are charged per game, with no upper time limit on how long you can play for. Games usually last just over an hour. What does Hollywood Bowl class as a ‘Junior’? Hollywood Bowl’s ‘junior’ discount applies to those aged 0 - 15. They recommend 4 as the minimum age for bowlers, as the lightest ball is nearly 3kg! All centres offer ramps and gutter bumpers for the little ones. For bookings, prices and party packages, contact your local Hollywood Bowl. Click here for to find the nearest centre to you. Opening times vary, to find the opening times for your local Hollywood Bowl, click here. If you’re looking to make some magical memories, look no further than Hollywood Bowl. With more than 50 centres across the UK, Hollywood Bowl has something for everyone, from pool tables to arcade amusements to, of course, bowling! With one of our Hollywood Bowl promo codes you can save big on a fun day out for all the family over the summer. 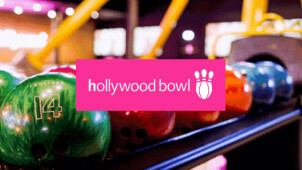 With fantastic food and drink on offer, as well as a huge range of great activities, score a real strike with a trip to Hollywood Bowl! Named after the world-famous concert venue in Los Angeles, California, Hollywood Bowl brings all the glitz and the glamour of Hollywood to the UK. With over 20 years refining the perfect day out, Hollywood Bowl promises an incredible experience for all ages. Adults can relive the joys of their youth, with vintage arcade games, slot machines and air-hockey. Don’t forget the bowling, though. With at least 16 lanes in each centre, Hollywood Bowl is right up your alley! Enjoy a feast at Hollywood Bowl and indulge in some good old-fashioned American decadence this summer. With lots of all-American classics on offer, such as nachos, hotdogs and burgers, let these flavours fly you across the Atlantic. Stay out of the gutter with a Hollywood Bowl voucher, and fill up on food to fuel your A-game. Hollywood Bowl even offers diners the option to order from their lane, so if you’re hungry you don’t need to skip a turn.